Bed #1: Paris Romaine and Red Oak Leaf Lettuces. The salad bar is open! I’m harvesting immature leaves almost daily now, and enjoying them on my new favorite thing: Black Bean Burgers (recipe here). Bed #2: Chives and more greens. The chive clump is sporting a bouquet of edible pink blossoms now. Also planted in the bed are seedlings of Italian parsley, Bloomsdale spinach, and frizzy-leaved Frisée. 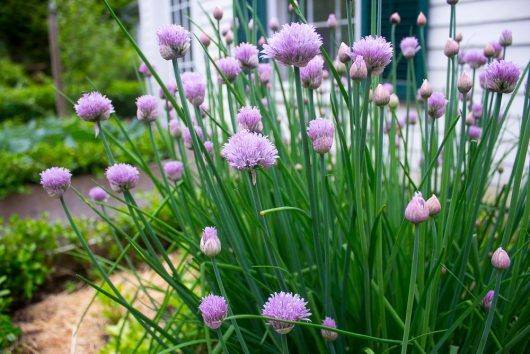 Are your chives currently in bloom? If so, you might like to make this Chive Blossom Vinegar. Alternatively, you can scatter the petals over soup, or throw them into this quick-bread batter or this homemade butter. Bed #3: Carrots and Turnips. If you’ve ever planted carrot seeds, you already know the seedlings are a pain in the neck to thin out. I’ll thin mine as the roots achieve “baby size”. This way I can eat what I pull. I’m already eating turnip greens. Sauteed, they’re delicious in stir-fries, pasta, and more. Bed #4: Cabbage. I planted a common red variety as well as the fanciful green ‘Savoy.’ The leaves are growing with gusto now, and I suspect the plants will “head-up” later this month. Now it’s your turn. In the comments field below, let me know how your own veggies are coming along. Anyone harvesting tomatoes yet? If so, I’m jealous of you! Have you had any problems with box blight? Hi Christine – Mercifully, no trouble with box blight here. Maybe the newer varieties (such as I have) are immune to it. Hope so! My rosemary is thriving and I am thinking out the parsley and basil I am growing from seed. The super sweet 100 tomatoes already have tomatoes on them. We also grow other tomatoes, green peppers, cucumbers and zucchini. Do you have any suggestions for turning hydrangeas blue? I’ve bought the expensive stuff in the bags 2 years in a row but mine are still pink. Finally able to harvest enough romaine for two dinner salads tonight! First year of organic gardening much more challenging. Gotta get after those little bugs! Garlic and potatoes are over 2′ tall and apparently have plans for a space launch. Spuds are blooming, and I stuck a few more in a patch vacated by arugula, which I’m tossing in the pasta water and enjoying with pesto. Sugar snaps are blooming, and tomatoes, carrots, peppers, beets, fennel, onions, leeks, edamame, pole beans, cukes, cantaloupe, butternut and zuccini squashes are in and growing, but a long way from harvesting. Have a lot of red and green salad bowl lettuces keeping me in greens. Deer are decimating lilies, rose buds, sedums, heuchera, etc. I’ve never had so much damage. They seem to have spread the word that my yard is a dessert bar. My garden is starting to take off; I have my first teeny, tiny, little green tomato. All my early tomatoes have flowers. My Beefsteak and cherry tomatoes are going to have blossoms soon (I hope). Thanks for posting a picture of the garden. Love, love, love your garden and totally enjoy your blog…thank you for taking the time and energy to reach out to so many people. 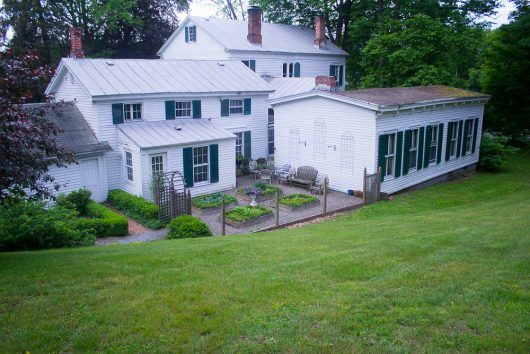 I have 17 acres that I recently purchased and have planted quite a substantial garden this year. I have a challenge for you Kevin. If I knew how to post the pictures of my granddaughters hands, you would be able to see what wheat has done to her…and then I could show you the healing once wheat was removed from her diet . My challenge is: can you come up with a delish sandwich bread recipe that is gluten and wheat free. Once you get into the process and science of making recipes gluten free, it is really quite interesting, fun and entertaining. Here in sunny, almost over our drought Gulfport, Florida, we are about to pull out all our plants and prepare for our next planting in November-December. We used earth boxes on a high workbench for me( I had a spinal fusion so no bending) and my wife used the 2 raised beds. These earth boxes, 1 store bought for about $90. And the other 4 that MJ built for under $10 each did a fabulous fantastic job with Black Seeded lettuce, Compari tomatoes and a few kinds of cherry tomatoes. We bought 6 tomato plants, one was a Roma, most were “volunteers ” from the compost barrel. I have been roasting, saucing tomatoes until last week when these huge and numerous Stink bugs discovered our tomatoes. I tried a few organic sprays as well as my own soapy water etc- to no avail. So we pull up every thing and wait uuntil Nov. to plant again. This was a great year for cukes, tomatoes,beans,snap peas. I grew up in Brooklyn and moved up to Delaware county NY in the 70’s (every hippies’ dream) Florida is soooo different. All my veggies are still in their half milk jugs on my leeward porch. The Adirondack winds are still too strong, but I’m going to get the beds completely ready to receive them. I’m still so happy you taught me about winter sowing. Last year, I experimented by taking the seedlings out of their jugs and planting them in individual paper pots I had made. This year, I’m back to leaving them in their jugs until planting day. They’re happier there. Mpls,Mn – we hare deep into salads – lettuce, two kinds of Spinach and radishes are doing well. Everything else is very small – not sure what is up this year but all my seedling have stayed very small. (Cool damp weather I guess). I have carrots, basil, cilantro, dill, beets, peppers, tomatoes, and onions all in raised beds very slowly growing. Hope they pick up speedd now that some warm weather has hit. Potatoes and another set of onions went in later so they are not out of the ground yet. Here’s hoping it all grows. The rest of my herbs are in the back rock garden and are new plants this year since the winter killed off all but the oregano. Happy Planting everyone! Hi Kevin, My garden is coming along here in Kentucky (zone 6b). I’ve been eating kale like it’s the only thing growing. I have dinosaur kale, curly kale, and red Russian kale. My squash are in bloom and I have tomatoes on the vine. I noticed a tiny cherry tomato yesterday just getting a tinge of pink! I have banana peppers to pick and my “lettuce bowl” has been growing like crazy (I used 36 inch diameter galvanized fire rings for raised beds…I love the look!” At $39 each…very affordable!) If you don’t grow pineapple sage…you should! It’s beautiful, fragrant, and produces stunning red blossoms. Happy gardening, Kevin! This was my first year to try your winter sowing technique using milk jugs. We moved in February and I hauled milk jugs with me:) In April I freed all those tiny plants and just stuck them in any ol’ place around the house as there has been no time to actually prepare a garden space here. I now have corn up over a foot and squash covering the ground underneath the corn. Sadly, the lettuce and spinach didn’t make the trip over and the weather went from 45 degrees one week to the high 80’s the next so my broccoli bolted and the snap peas shriveled. The zinnias I planted have buds on them. I am thrilled to be in my garden every day! Harvesting lettuce for salads two times a day and snipping away at my herbs (parsley, chive, cilantro, rosemary, tarragon, and thyme). Pea plants are shooting for the sky. So much fun watching everything grow. I’ve planted a garden at my preschool. I had dreams of an orderly garden…the children planted up some milk jugs to give us a head start. They loved checking on them. And got very excited when they spied the baby plants. I realized that an orderly garden was not going to happen with my excited little crew. I have thrown caution to the wind. I just handed out seeds and let them plant wherever they wanted. We have 7 raised beds and 3 patches near the building. We have a strawberry patch that is LOADED with berries. Snow peas are up. Cucumbers, tomatoes, nasturtiums, lettuces, radish, carrot and more. All in wild abandon. I plopped in the plants we grew in milk jugs. It’s like magic. The children love checking on the plants and get so excited about everything. I’d like to replicate your garden, when you put down the gravel, did you put down any sheeting underneath? do you need to spray to keep the weeds away? I’m trying to keep things organic and pesticide free as much as possible. Thanks for your post! it’s inspirational. My gardening plans were derailed a month ago today in a fall hiking. But with help from friend, family and paid helpers we got most everything I want in and started. Eating lots of orache/red miner’s spinach, Japanese greens and thinnings from beets kale and chard. Enjoying first radishes. The surprise is the collards I cut all the way back but didn’t pull up last fall are going gangbusters. Oh and not to forget the scapes!!! It’s Theresa in Durango Colorado. My chives are blooming too! This is the second that I have made chive vinegar, love the beautiful tint and the second year that I’ve made the chive pesto. Love Love lLove it! Two years ago I printed off the lavender shortbread cookie recipe but still haven’t made them. This year I truly am going to make them. My lavender is just starting to bud. I can’t wait! We had a late hard frost, sadly I won’t have any plums, pears or sweet cherries but my tart cherry tree is loooooaaaded. In my vegetable garden, my lettuce spinach radishes and carrots are up and need to be thinned. I love a garden for the house. Thanks for the inspiration. I have lettuce and tomatoes, Italian parsley, rosemary, lemon thyme, basil, hot peppers, peas, eggplant, a variety of squash and cucumbers. I also have shallots, onions, garlic chives, arugula and carrots. The oregano I keep in a pot because it’s so invasive. It’s already so hot here that if it doesn’t get watered everyday it’s Wilted by noon! Welcome to Salt Lake City! Hi, Kevin! Here in southeast Ohio, it’s hot & dry already! I have 4 raised beds (4X8) and one smaller (4X4), mixed in some horse manure from a friend and my own compost last fall & it has really seemed to help a great deal. I have beets that will be ready soon (the thinnings are yummy too), green beans – both bush and climbers – zucchini & yellow squash, green & red peppers, and 6 kinds of tomatoes. The 4X4 is reserved this year for 4 cherry tomato plants, one on each side of a 4-sided metal trellis. This worked well last year, but in a different spot, as I try to rotate every year. 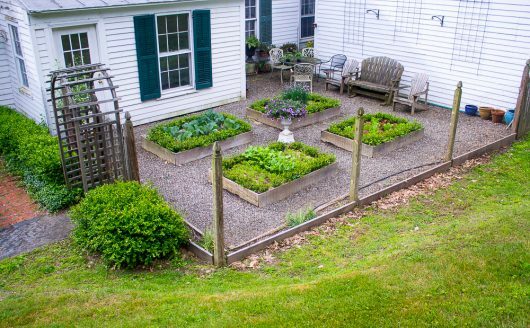 Wish I had the energy for a HUGE garden like I used to have, but 5 back surgeries and a heart attack have slowed me down a bit ; )….Love you & posts! I planted my chard in containers this year to keep the bunnies away and it is thriving. Last year the rabbits got every single bite for themselves. I tried a new variety of kale called Nash’s that struggled to germinate and has struggled to grow. No idea why. My arugula and mesclun bolted, but now have my Bibb lettuce coming in beautifully. Also new this year is Eleonora basil which is supposed to have some resistance to basil downy mildew. So far so good so keeping my fingers crossed that I can enjoy my own basil again. The hot weather stuff , tomatoes, peppers, and beans are not taking off just yet. Waiting to see some new growth. 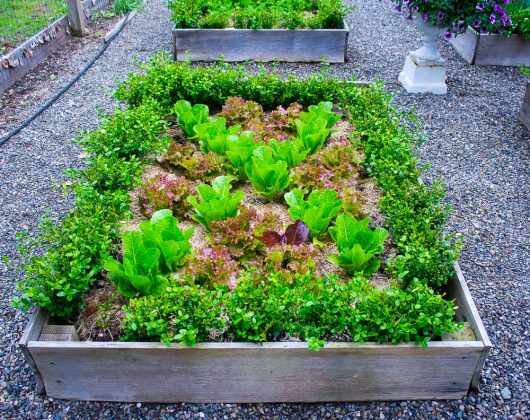 I so love how you planted that lettuce bed. Greetings from Vashon Island, WA: a long cool wet spring means our gardens are about a month behind here. But the chives are loving it! I’m trying to keep them contained, use them, and give them away to friends and neighbors. I made the chive pesto last year, and I’ll try the quick bread soon. Roses are finally blooming a bit; tomato plants (from starts this year) have a couple yellow flowers; peas, beans, cucumbers sprouting. Our kale plants over-wintered, and we planted new ones too. Looking forward to more sunny days! 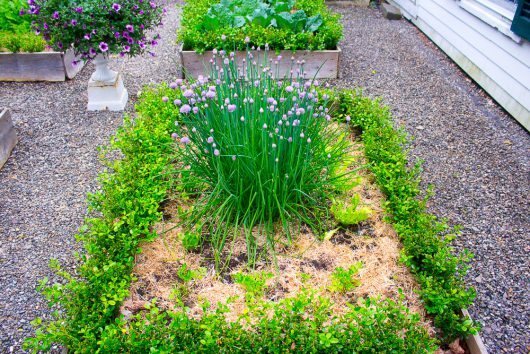 Is that parsley around the edges of each garden? I’m in So Cal and got an early start this year. I’ve enjoyed 2 cucumbers already, several cherry tomatoes and 4 lovely and oh so delicious tomatoes. My 3 planted and 2 volunteer tomato plants are covered with green tomatoes and I’m very much looking forward to enjoying them, making tomato pie and sharing with my neighbors. depleted of nitrogen this year so we added a little more (blood meal) and boy have we seen a big difference. I just got my tomato plants in the ground yesterday, here in St. Cloud, MN. Paris Romaine self-seeded over most of a 4′ X 10′ bed. I have 100’s of eatable plants right now. I’ll pull some of those, eat them and get more red lettuce and beet seeds in. I need to trellis my ‘Purple Royalty’ raspberries. These are a hybrid of wild raspberries and blackberries. The berries look like blackberries and have the ‘wild’ growth habit- very vigorous! Weeds are very plentiful this year – they are all growing very happily everywhere. Ugh. until I figure out how to contend with hungry (and annoying) gophers. basil, cilantro, and repeated performance from last year: chives, thyme, and rosemary. I keep adding more flowers to the mix, too. The bees and butterflies are happy. Mary in Iowa. I keep seeing your posts here and I, too, am from Iowa. I live in the CR area. How about you? My veggie box of salads was doing well until 6 little bunny rabbits decided to make my walled garden their new home. Any remedies to cute but hungry bunnys? I love looking at your garden- especially as mine is a disaster! So cold and rainy on Long Island that my seeds disintegrated instead of sprouting. My overwintering herbs are struggling, but a brief bout of warmth and sun seem to have revived them. Iris! Who woulda thunk it?! Outstanding year for my antique iris. The garden peas are about 3 inches tall from the re-planting. Another chilly, rainy day here, so rather than attempt to do anything creative outside, I’m baking my favourite cheddar cheese loaves. The herbs are still small, but small quantities for home cooking are available. The biggest thing in the garden is elephant garlic. Planted last fall, I’m starting to get scapes on them now! weather is always a big contributor. First, cold and rainy, lots of mushrooms popping up unexpectedly. Now hot, everything drying out. The predicted rains keep going north of us. thank goodness herbs are fairly resilient! Elle in the CR area. I’m In DM. Spent 5th and 6th grades in CR. It’s a beautiful, clean, spotless city. Well, it was in 1953-56. Haven’t been there in many decades. It is fun to read how everyone else’s gardening is coming (or going?). Here in southeast Michigan I am behind schedule. Have planted only 4 of 12 tomatoes, and have lots of other starts (Squash, Pumpkin, and flowers) waiting to go in. The garlic I put in last October is thriving. Salivating over the coming scapes. I had no idea that Chive flowers were edible! Thanks for teaching me something new. Kevin, I’ve been enjoying your blog for years – Thank you! I envy your herb garden 🙂 We moved last summer from the San Francisco Bay Area to the Northern California mountains. While we love living in a forest, our yard doesn’t get much sunlight. We’ll eventually install raised beds, but for this year we tried straw bales – we put 3 bales in the sunniest area we have, fertilized and watered them for a few weeks, then planted our veggies right into them. The plants love it and no bending over to reach the plants. We couldn’t put much in just 3 bales, but we have 3 kinds of tomatoes, spaghetti squash, watermelon, eggplant, basil, garlic chives, cilantro, and lettuce. Not surprisingly, the shade-loving veggies are doing better than the sun-lovers, but we’re hoping for the best. And that the deer don’t discover them. We are on the north shore of Long Island near the Queens/Nassau border. We have a variety of lettuces that are taking their sweet time and some ridiculous radiccho that is snoozing its way through this spring. Our arugula has been very slow and before it matures it bolts. On the bright side, I just harvested bags of kale, bok choy and chard. The tomatoes and peppers are waiting for some heat although there is an heirloom cherry that has a few tomatoes on it. We are trying, for the first time, an heirloom tomato called Paul Robeson. Have you tried it? Apparently, it has a cult following. We will have to see in 90 days if it lives up to all the hype. Happy gardening! Your garden looks great, Kevin. About the same stage as mine. I am doing the straw (hay) bale thing again this year. I am using old hay bales that didn’t have seed heads when baled last summer. They came from our barn and I know the field source. Better than last year when I bought sprayed ryegrass straw bales. We are having an on and off again spring here in the west. I am comfy in a sweatshirt today, a short sleeved t-shirt yesterday, but the peas, cabbage, lettuce, onions and carrots are loving it. The tomatoes are doing well also. The cucs, peppers and eggplants are waiting for warmer days, but at least their feet (roots) are warm in the bales,so they look happy enough. Oh, yah….I forgot about how nice the beans are looking. Mine is not nearly as neat and organized as yours. Love your photos. Kevin your gardens are works of art! The bunnies that always lived under my neighbors deck have moved to under my porch. Has anyone every dried powdered laundry detergent as a deterrent? Do they eat tomatoe plants and calendulas? Planted my tomatoes mid-May here in Pgh, mostly brandywines, one Cherokee purple, one big beef and two super sweet 100’s. Envious, since I have no garden this year. Hoping to get a house in the fall. Lots of inspiration from your gardens. Thanks. Here in SE Neb, it was a coolish spring and now HOT! I didn’t get any potatoes in nor onions and I miss them already. This weekend I did finally get the tomatoes & peppers mulched with moldy hay. DSon planted cucumbers and squash, but fairly close together. We may have cucumber-tasting squash or squash-tasting cukes. One eggplant just in case the squash bugs find the zucchini before I get any. A new-to-me, Green Zebra tomato, is planted in a big pot on the patio near the herb crock filled with chives, English thyme, Lemon thyme and rosemary. The 4 basil plants are in the other raised bed with the 6-foot row of self-seeded Dill. The dill and walking onions are the only thing ready to harvest now. Oh and the strawberries. The asparagus, strawberry & rhubarb beds all need some TLC but I need more hours in my day to get to that. I know we’ll get plenty from the garden (barring bad storms) but it’s not the best garden I’ve had. Here in SW ON (zone 6/7) the weather has been yoyo like! Planted beans, radishes and carrots and they are just poking through the soil in my modest raised bed. Bought and planted a sungold tomato and it has some tiny green baby tomatoes already. Anticipation is a wonderful thing! Oh, and the chives are blooming! Well the flowers are great (except for the peonies which will not bloom this year.Our grand son thought they were just “green stuff” and cut them back to the ground! boo hoo! When he saw how dismayed I was he said what can I do to make up for it. and he then dug out deep rooted weeds for several hours. Gosh I love that boy! My veggie attempts were awful . The radish s never made anything but stringy roots and then flowers. and the peas gave me three whole plea pods. My family would starve if they had to depend on my skills Good thing I know a great farmers market ! Kevin, your garden looks lush! Here in Edmond, OK it has been a cool spring. Oh happy day because that will change and I will be waiting for September and the heat to break. On the down side beans have been planted 3 times and something buggy is getting them as fast as the break ground. However, I harvested most onions and one of the cabbages yesterday. 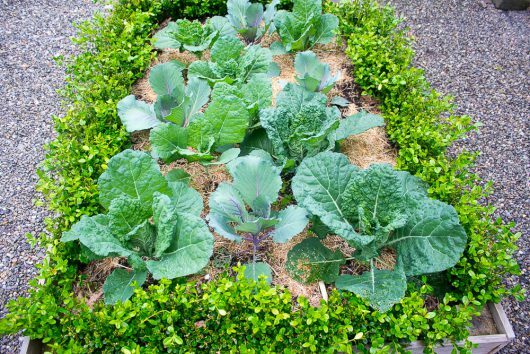 I have had to grown cabbage under lightweight garden cloth to beat the cabbage moths–and it worked! Gardening is always an experiment in my garden. Love how you are artistic with your planting! I have just about finished harvesting the lettuce I planted as purchased starts in my planters with pansys this spring and will now add annual flowers to the pansys for the rest of the summer. My vegetable garden here in eastern MA could use a little less rain and a lot more sun and warmth in particular. My many milk jugs are full of seedlings awaiting transplant either to pots or the garden. The rain has been beneficial to the strawberries, raspberries, herbs and perennials. It is nice to be able to harvest fresh herbs again and to bring in bouquets of flowers. Mine is just getting going. I’m in zone 5b on the coast of Maine where we’ve had endless days of rain and really cool temperatures. We’re re-arranging our vegetable garden, which has led to late planting of nearly everything. My chives are not blossoming yet but they want to, if only we would get sun again. I’ve never made chive vinegar but it sounds great. This is only my second year with chives. Do I want to cut them all the way to the ground once I harvest the blossoms? Can I dry the blossoms for decoration? Two tomato seedlings, of 18, mysteriously disappeared. Sowed peas 3 times and still have an inadequate amount of vines. Birds proceeded to pull off the tasty tips of each pea vine forcing me to cover the entire patch with a huge piece of tulle netting. Sweet Pea vines enduring similar attacks. Onions look most unhappy with excess rainfall and lack of heat. Cucumber seedlings are being chewed every night by something, inspiring a beer trap which caught about a hundred pill bugs and a couple slugs. Bush Bean seedlings also chewed nearly beyond redemption. My Rhubarb was divided last fall so no harvest this year, just to give it a chance to recover. I am not happy with 2017’s garden progress thus far. The best news comes from Lettuce, Garlic, Chives, Mint, Sage, Alpine Strawberries, Fig Tree and Raspberries. Carrot seeds were adhered to toilet paper seed tapes using flour/water glue, a winter activity which makes sowing super fast and I don’t have to stop to find my reading glasses and take them outside to handle these tiny seeds. The frequent rains are keeping this bed wet so I hope for excellent germination. Your photos are so lovely! Green beans look good, herbs are marvelous, chives ready to deadhead, tomatoes and basil in companionable sections doing well. I am so proud of myself for winter sewing my San Marzano tomatoes from last year. They are wonderful for all Italian dishes. Even gave some away as party favors!! Raspberries full of blooms, pepper also. 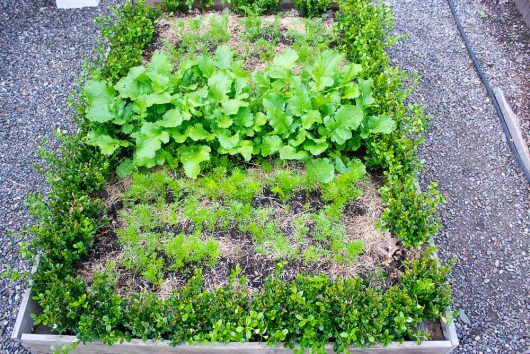 Your raised beds look great, but how do you keep groundhogs, rabbits and deer out of them? I had a pot of nasturtiums nibbled so I had to hang them. Aren’t the leaves too peppery for most animals? I planted many tomatoes, lettuces and broccolit raab. This year I added peas that grow to only 6-8 inches and 24″ in pots and window boxes along with herbs. I have 3 types of basil, dill, curly and Italian parsley, dill and rosemary. We have harvested chamomile, onions and kale. We have potatoes, tomatoes, squash and garlic in the works. I always have random basils and sunflowers come up and the volunteers are always strong and sturdy. I love your gardens because they are always so neat and artistic while mine are naturally eclectic! Lol Thanks for always sharing pictures and ideas. I’m in Pittsburgh and I winter sowed for my new house garden this year. My tomatoes are still very small. I’m not sure how they’ll do. Snap peas were a bust, as well as basil from seed, but the cucumbers, tender herbs, kale, and some bibb and slobolt lettuce did great. Absolutely none of my heritage marigolds grew. I save seed from a few ivory varieties and plant every year, and I’ve never had this problem. Can’t find ivory marigolds in the garden centers either, so maybe it’s not just me. I feel like I set back my winter sowing transplanting it – I used a sharp knife, but some of it really seemed to not have much root support. I still planted about 3x what we had last year (our first whole summer in the new house after a dreadful attempt to start seeds indoors with wide soffits), so I guess we’ll have enough. Been eating green salads and making garlic scape dressing for a few weeks. Beth (Comment #42), I love the idea about using the bed frame and trellis to protect your raised beds. This might also be a great cover in the fall and early spring when we get those random frosts. Thanks! We here in central Maryland have had the same kind of weather as you – cool, rainy and cloudy. We only had 9 days in May with no rain!! I have planted lima beans which are doing nicely. I will put a few tomatoes in next week. I recently got my garden in after a very wet winter in Oregon. I planted pea seeds 3 times and each time something ate the starts. Things are growing: tomatoes, cucumbers, yellow summer squash, celery (who knew), red sweet pepper, parsley, arugala and basil. I spend most of my time fighting weeds and slugs, oh yeah strawberries are coming on strong and the slugs love them! Thanks, Kevin, as always for sharing! Beautiful garden! I am way behind, just got tomatoes, peppers, wax beans and Romanesque in the ground this past week (in SW Ohio, zone 6a/5b line). Another (usually free) component you can add to the soil is composted horse manure. It makes our flower and veggie gardens POP! 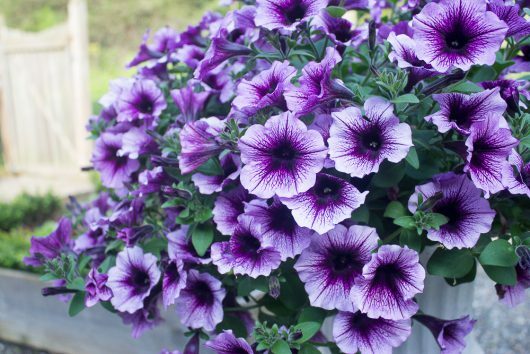 I too love Espoma Garden Tone, it saved my petunias last year. Have a great day! Thanks for sharing blueberry tart – it looks amazing! It’s been a tough frustrating start for vegetable gardening this spring – first, it rained, rained and rained followed by lots of flooding. Then it became very hot and windy requiring watering every day twice a day. Very discouraging. Radishes, spinach, coriander and lettuces have now all bolted and I pulled them out. It’s 99 degrees again today. Many seedlings that I planted in the vegetable garden simply dried up despite the watering and shading efforts. The baby kale and spinach that I had planted in pots on the porch were awesome in early April but they now are failing as well. Hope this doesn’t continue – beans are drying up too….. So sad. Here in NE Oklahoma I am already harvesting tomatoes, onions (4 in bulbs), yellow squash, spinach, lettuce and ground cherries. Everything seems to love this very hot, humid weather we are . That is everything but me. I got a tad of a late start but everything is in now. My tarragon is almost waist high as well as my bee balm. I think I got carried away with the pie pumpkins again this year but that is okay. It just means more pumpkin pie! I did a theme this year. In the two years I have gotten into heirloom veggies and flowers. This year I did an heirloom rainbow garden in an effort to get the little folk in my life to eat more veggies. So far they are excited to pick what was planted. The favorite is purple beans ( purple tepee I think) that turn green when cooked. They loved them last year. I also did a few edible flowers. I’m trying to branch out taste wise. I also planted stuff in mind for the chickens. They love spinach! All in all things are looking good. Now I can’t wait to can, freeze and put up the goodies from the garden for winter.